Rubber Room Ramblings: STAMPIN' UP! BLENDABILITIES HOLDER! Last week I had some play time with my demo friend, Nancy. We made a little something to hold the new Blendabilities from Stampin' Up! This one is our second attempt, but it meets all of our storage needs. 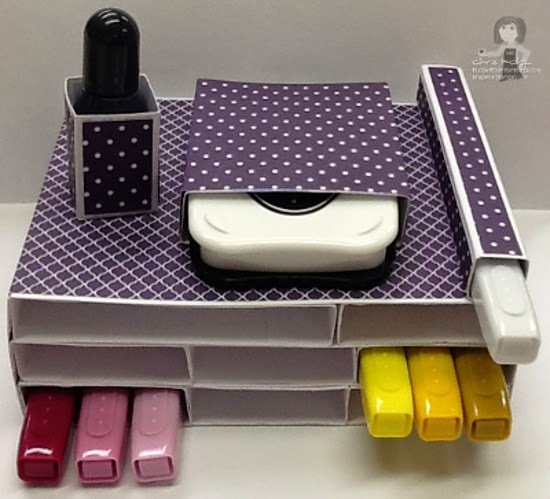 As you can see, attached to the top of the box are holders for the Blendabilities Color Lifter, the Momento Ink Pad and the Ink Refill. You can slide the box your Blendabilities come in right into a cubby/slot. Or, you can take your Blendabilities out of their box an store them individually in a cubby/slot. Or you can do a little of both, if you would like. AND you can slide a whole cubby/slot right out with your Blendabilities in it. Notice how that top cubby/slot is twice as wide as the rest of them? That is the cubby/slot that is designated for the Skin Tone Blendabilities, which come 6 in a pack. You can hold 7 sets of Blendabilities plus your Skin Tone Blendabilities in this container. If you are lucky enough to have all the Blendabilities Stampin' Up! offers, you can make another container, skip the top pieces and attach it to the bottom of this one. Everything you need to create your beautiful water-colored image is all in one spot and very portable. I will be working on a pattern/template for you and can hopefully put it altogether with a little video by next Monday, so be sure to stop back by and see how easy this is to make!